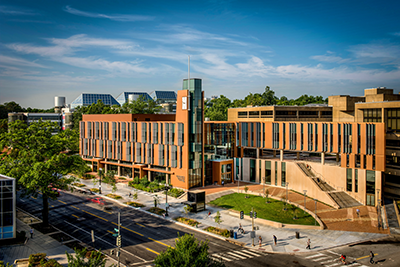 Washington, DC —The Student Center at the University of the District of Columbia this week was officially certified as a LEED Platinum facility by the U.S. Green Building Council, and becomes just the fourth notable structure in the District to receive this prestigious designation. 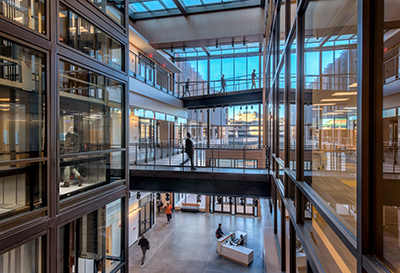 The LEED certification program – Leadership in Energy and Environmental Design – is the nationally accepted standard for the design, construction, and operation of high-performance green buildings. There are four LEED certification levels: certified, silver, gold and the highest, platinum. Certification is based on a point system in seven categories that include water efficiency, energy, indoor environmental quality, materials and resources, and innovation in design. 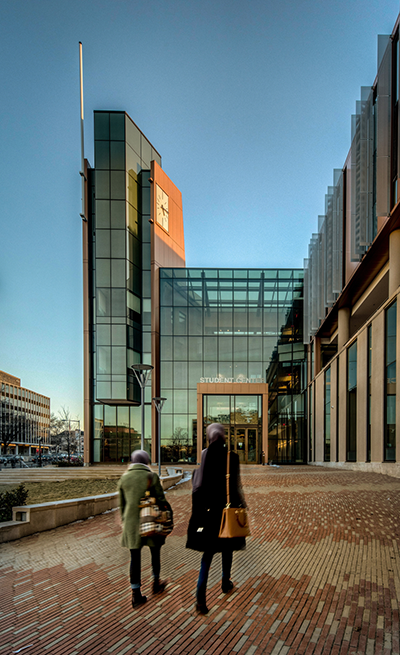 Completed in 2016, the 96,000 square foot building – with its looming clock tower – serves as a gateway to the UDC campus. 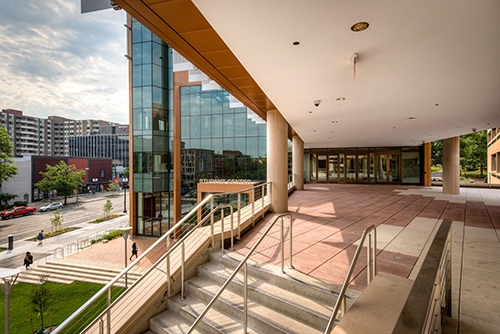 The $63 million facility is located at the intersection of Connecticut Avenue and Van Ness Street, NW. 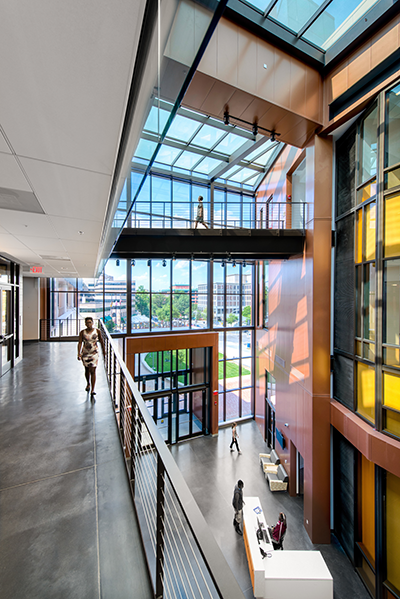 The architectural design is composed of a combination of masonry, glass and bronze metal that modulates between the institutional nature of the campus and the pedestrian character of the street. 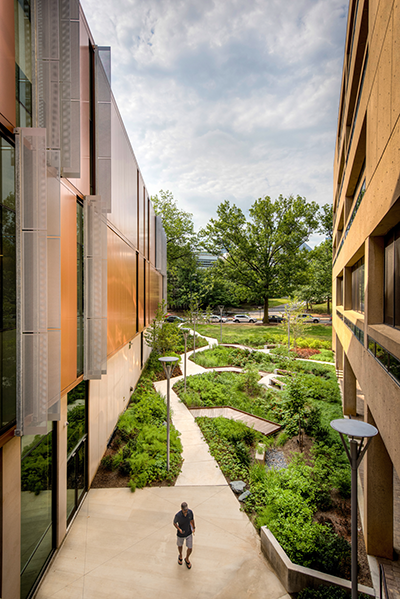 Sustainable design features are woven throughout the student center, including a 14,000 square foot green roof to reduce heating and cooling needs; photovoltaic panels to harness solar energy; an expansive rain garden to assist with storm water management and pollutant filtration; exterior sun shades on windows and insulated glazing that reduce heat gain inside the building while providing natural light to reduce electricity use; toilets that flush with captured rain water; and locally sourced, reclaimed, and recycled materials. 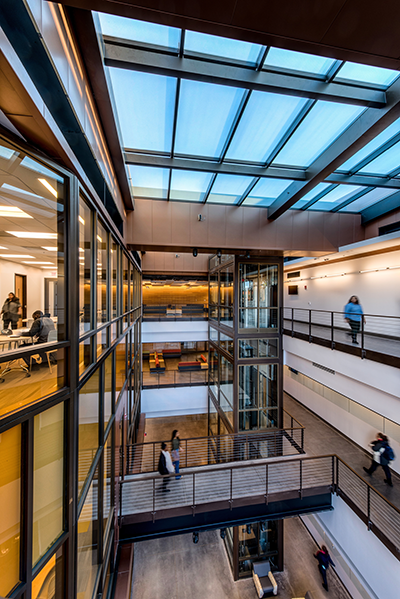 The LEED certification of the Student Center enhances a green footprint that includes a garden and greenhouse atop Building 44, which creates a living laboratory in support of the College of Agriculture, Urban Sustainability, and Environmental Sciences, and adds approximately 20,000 square feet of green space to the Van Ness Campus. Also, the recent renovation of the Dennard Plaza Deck has created a new “greener” area that features an eco-friendly storm water management system to help reduce runoff entering the city’s overburdened storm sewers.